This weekend saw my second attempt at Summits On The Air. I’d learned from last time, so this time came better prepared for a VHF activation. Both activations were successful with rapid responses on VHF plus some experimentation and a single contact on HF. The event also further helped my learning of radio operating and SOTA. This is a setup I have used before for RAYNET operations in the hills. I tested it using the antenna analyser before this trip, partly to confirm operation and partly to see if it would be suitable for use on a charity walk that I will be group leading. 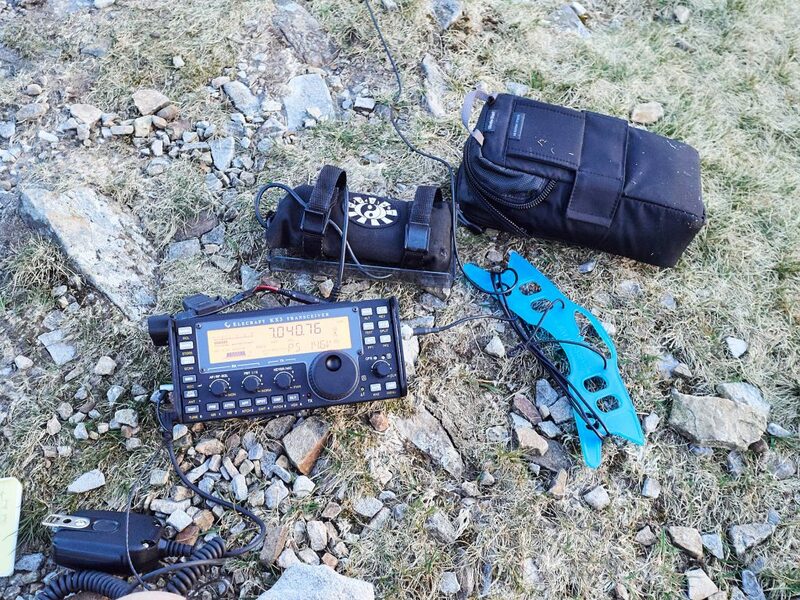 The charity walk will use licensed UK Light radios operating on a higher frequency – too high for this antenna. The exact response depends on how I move my head while carrying it, though it does not vary much. We can see that this antenna best covers the upper half of the 2m amateur band. This makes sense for an antenna designed for mobile FM operation. Performance on the hill dropped off notably at 145.300MHz which was surprising. It may not have been entirely due to my antenna. RAYNET operate below 145MHz and the antenna has worked well for that use. The antenna proved quite robust. A cork on top made it safer. It was bent as I climbed and it caught on the rocks, but survived. The radio was a Kenwood TH-K20 which I operated at 2W. I’m not convinced that its battery lasts as well as advertised, either that or the battery metering is poor. It had excellent reports though, a clear signal even if not strong for all stations. 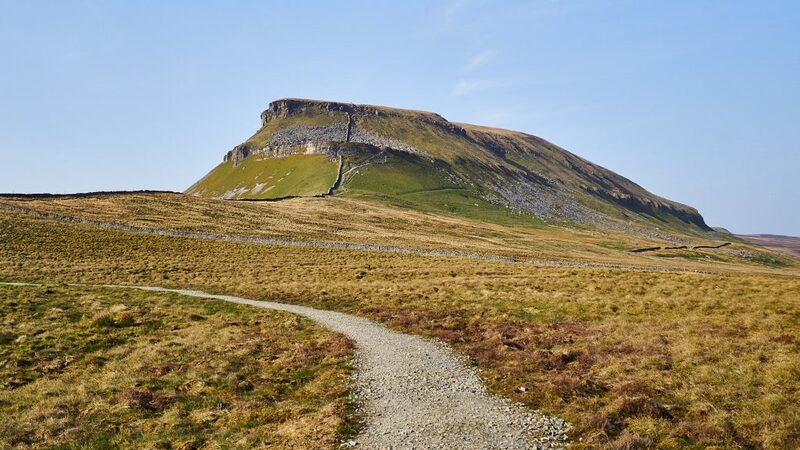 I approached Pen-y-Ghent from the Pennine Way giving me a base between the two summits I wanted to climb. This also reduced my total climbing thanks to the higher start position. I preloaded the route into the watch to see how that performed. Garmin’s web app was challenging to use but with effort also allowed me to label to two summits with the SOTA summit code. I was promised that my device would inform me on arrival – really useful. Unfortunately it seems that the 935 doesn’t support course markers so that didn’t happen. The watch will navigate well when its normal GPS tracking is enabled. Leave it in “Ultra-Track” mode and it will plague you with “Off Course” warnings. Fortunately battery life is good. I ran the watch with its more power hungry “GPS + GALILEO” setting and all worked fine. I could see the current time and the little red direction arrow. 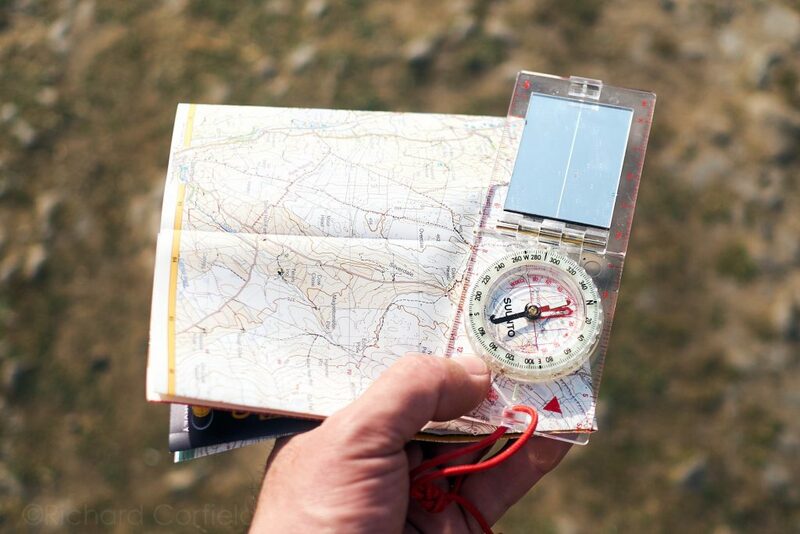 GPS may be useful, especially for telling you whether you are on or off course, but nothing beats a traditional map. The map allows the course to be re-planned. It also gives a lot more context. Here I can use the compass to confirm the choice of path. I have been spoiled by orienteering compasses which are designed to be stable while the user is moving around. 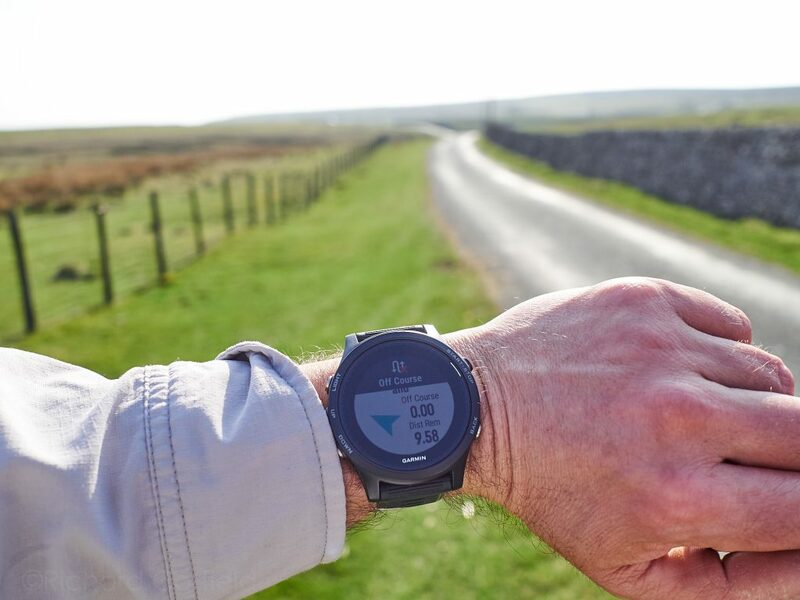 This Suunto spotting compass requires stillness and to be level in order to give a reading. The Harvey map was excellent, though I will have to add the missing path to it West of Pen-y-Ghent. It folds up easily to fit in a shorts or shirt pocket and can be folded map visible for frequent checking if needed. Can I walk under this with the antenna? 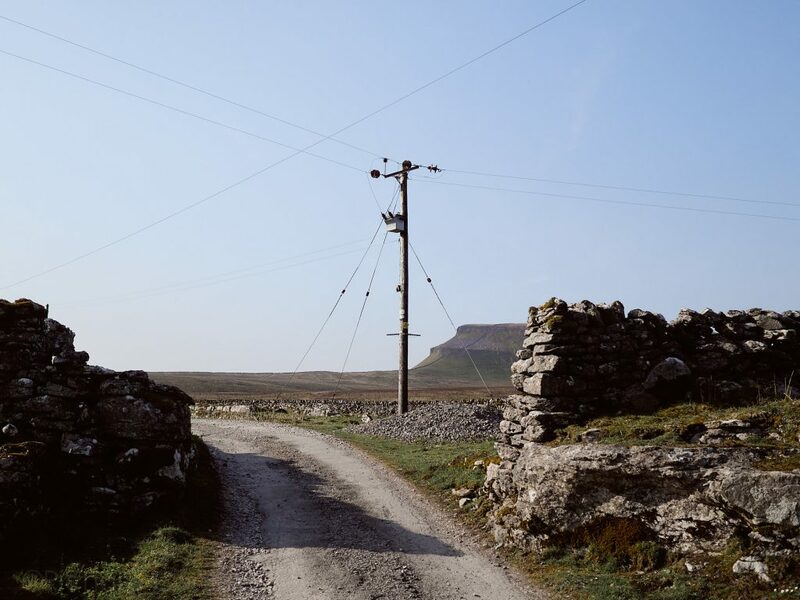 The climb to Pen-y-Ghent is a steep scramble. We’ve tended to walk the Three Peaks counter-clockwise so that we approach this ascending not descending. I met a group descending after completing all three peaks and didn’t envy them. Though when I came to descend I didn’t find it problematic. 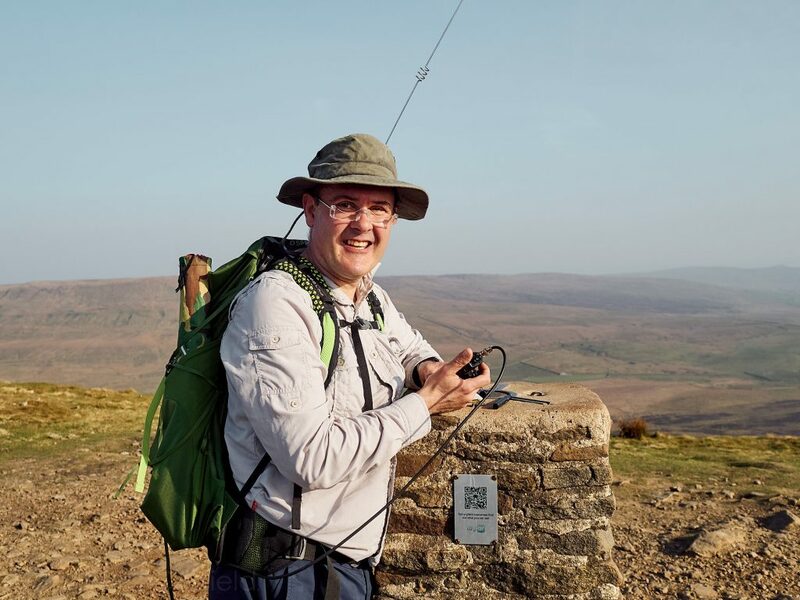 My Pen-y-Ghent activation was entirely VHF. I called CQ while approaching the triangulation point and soon had a reply from M6AIA. It didn’t take long to make four contacts, some of them over reasonable distances. I also had a very rude learning point, a mixture of faults there. I moved back to the calling frequency and made a quick contact, then called again. The station who responded was about to give me a frequency to change to when another station doubled with them wiping out their signal. That other station came on only to tell me off for using the calling frequency for too long. I tried to remake my contact, but without knowing which frequency they’d changed to I couldn’t find them. I then tried to answer a CQ call from a station in Wales who’s signal was weak but maybe I could get back to them. This prompted more rudeness from the valleys below, clearly only hearing my voice and not the station I was trying to reply to. I’m afraid I argued back. I explained what I was trying to do, and another station (G8BEK I think) rescued me. We both changed up to 144.550. That was a stressful experience and a few nearby walkers would have heard me fuming to myself for a bit while it was going on. 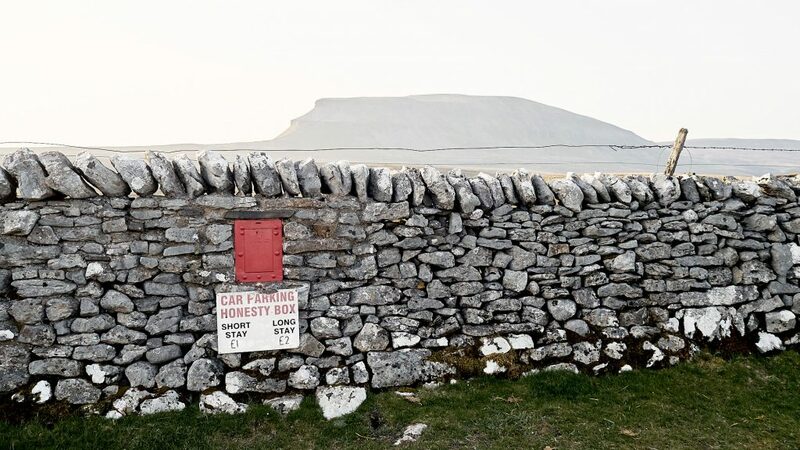 Pen-y-Ghent would have been an impressive place for the HF setup, but I decided I wanted to activate Fountains Fell and needed time to reach it before dark. I did make one contact on the way down which did not count towards SOTA. 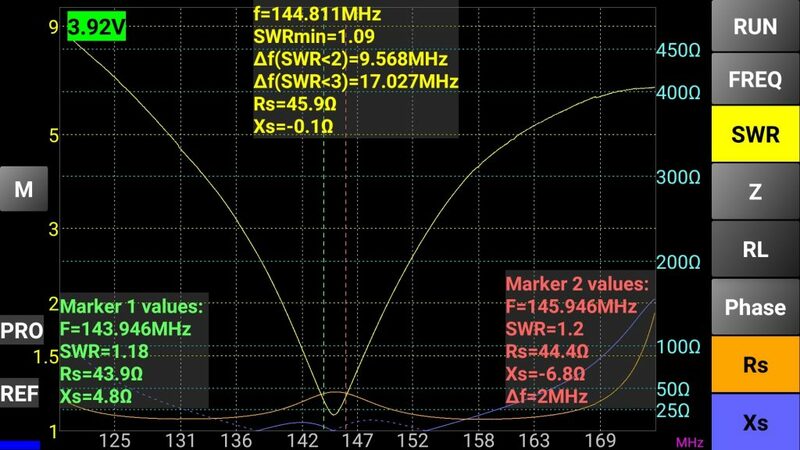 We did discuss the KX3’s 2m transverter which my contact was using with a linear amplifier. The transverter could make an interesting purchase one day giving all mode operation on 2m with one radio. The KX3 won’t make such a good handheld radio as the Kenwood or the KX2 (which doesn’t have 2m). 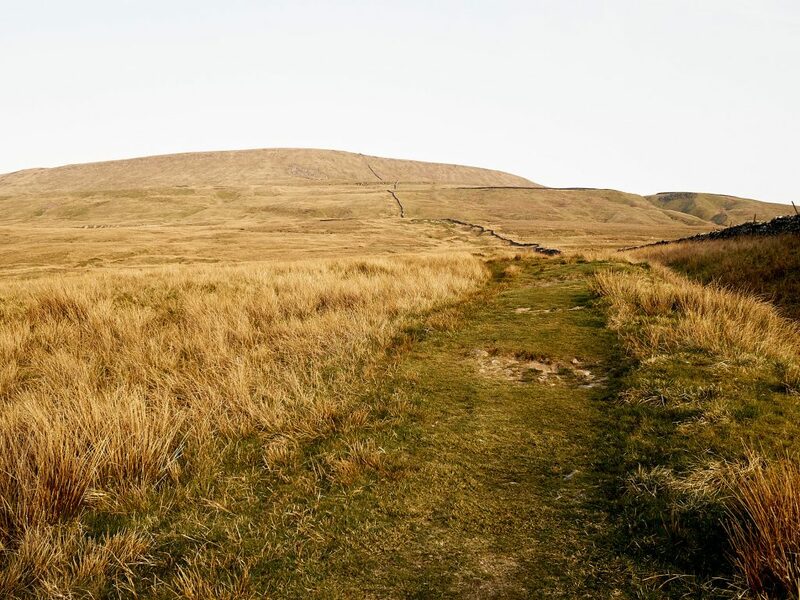 Fountains Fell is more a steady uphill walk than the steep scramble of Pen-y-Ghent. My original plan (and therefore the GPS route in my watch) was to follow the wall to the summit. 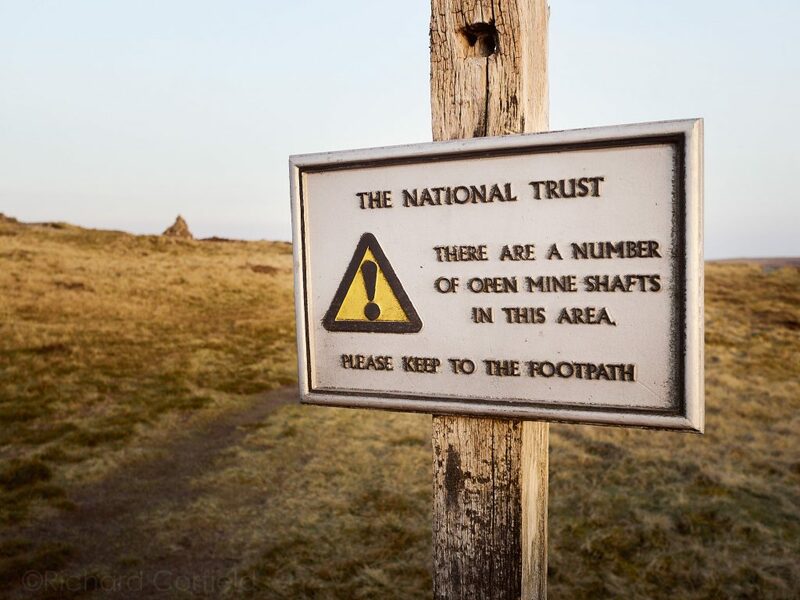 Warnings of lots of open mineshafts on top along with the steeper terrain and a clear alternate path to the East had me take the Pennine Way instead. 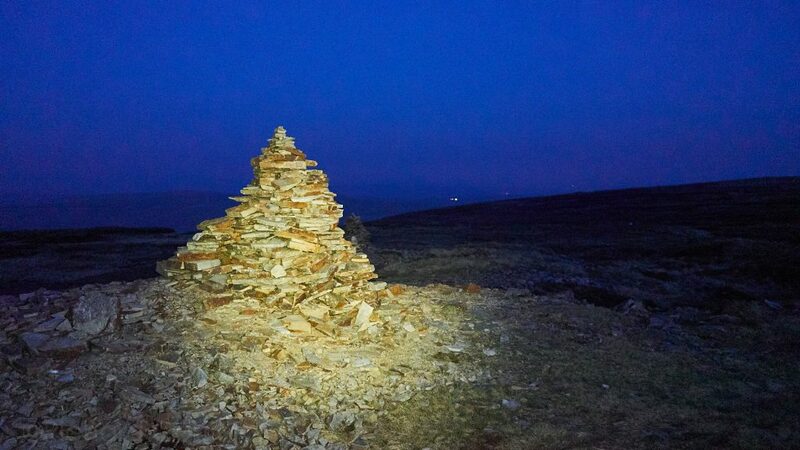 It made sense to stick to the paths, so I ended up operating from the cairns on the Pennine Way. This made a lot of sense especially given the descent in darkness. 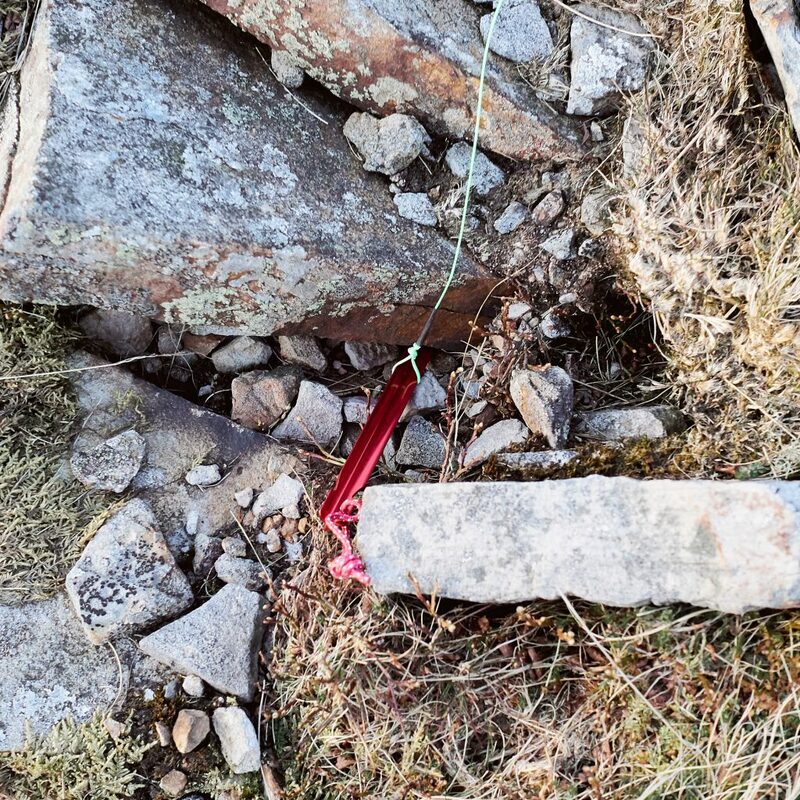 Even with a very good head torch, it’s best to avoid this kind of danger! The summit is a plateau. The contours on the Harvey maps are at 15m intervals. 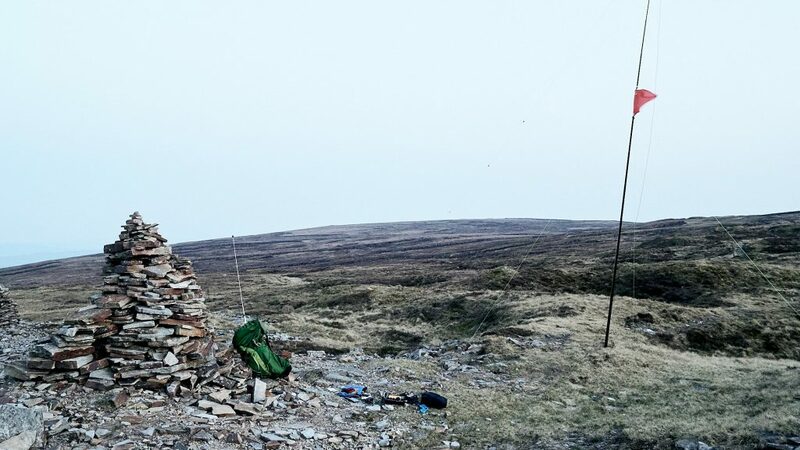 I was within one contour of the summit trig point so I believe within the activation zone. 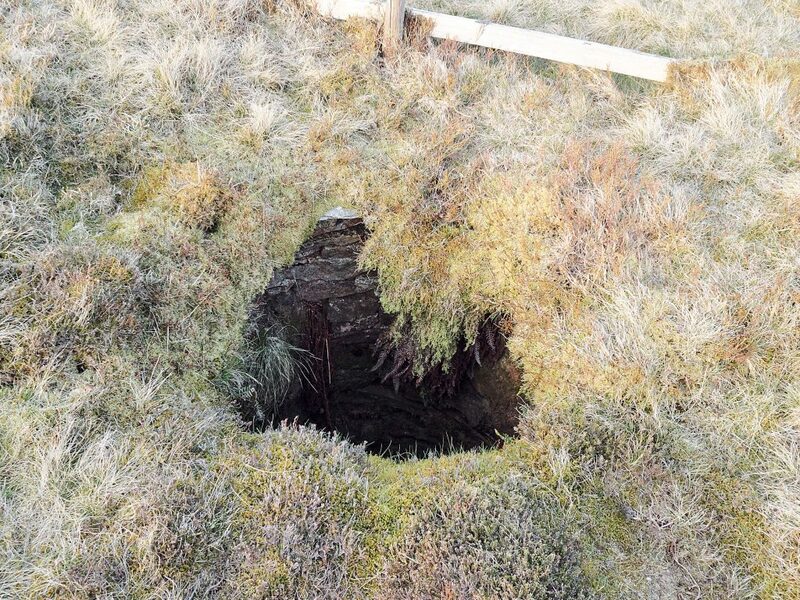 The summit trig point was visible across the moor and seemed a similar height to me. My VHF operation ran a lot more smoothly. I listened on 145.550 to see if that space was clear. Then called CQ on 145.500 and heard I think three stations calling back. Only the start of the first callsign was clear due to the way FM signals combine. I responded by asking everyone to move up to 145.550 then operated from there. Four contacts very quickly. 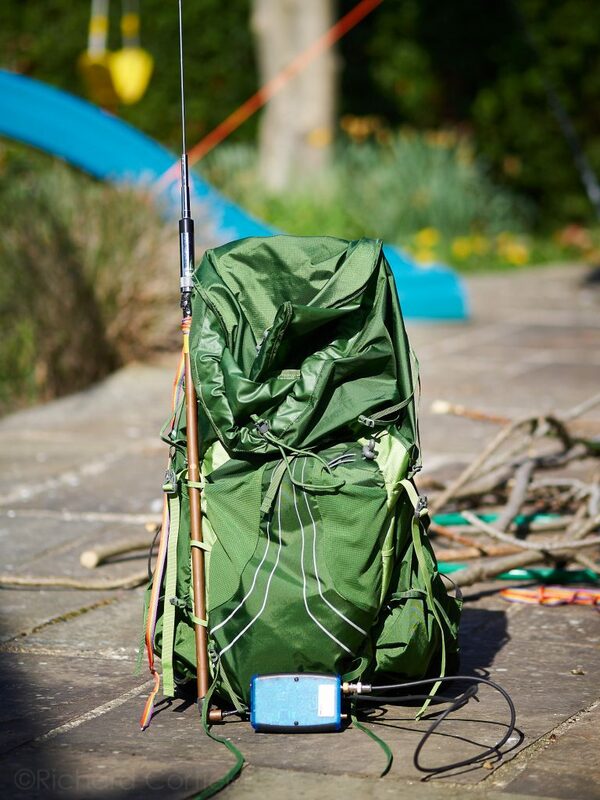 Once all responses had been answered I said I’d keep listening, put the rucksack down and started to set up the KX3. 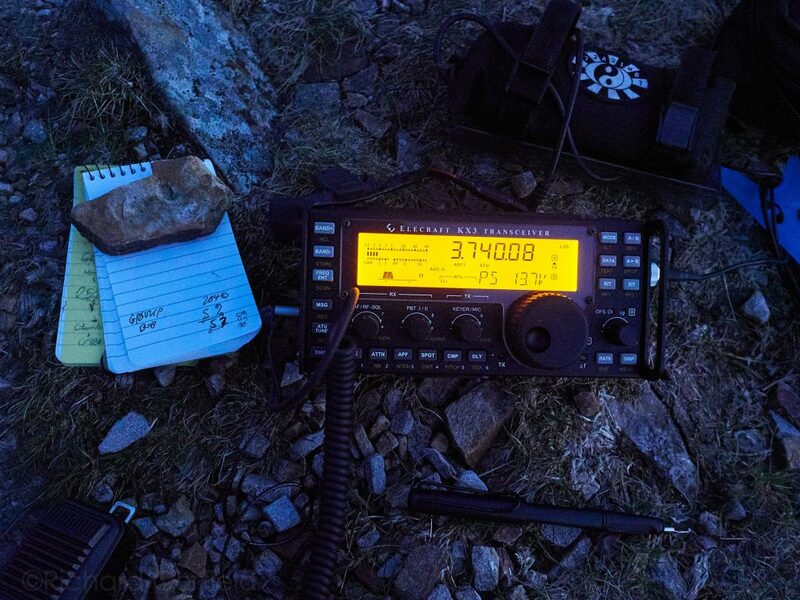 HF operation brings challenges. I have a radio that can hear a “gnat’s whisper”. On a mountain with very little background noise I seem to be able to hear everything! It’s very hard to find a clear part of the band to operate in. Maybe I need to start exploring less popular bands or start making more use of Morse Code in the CW section where there is more space and my limited power reaches further. Another problem is that my signal is weak and not so clearly audible to all those stations working against loud urban electrical noise. So even if I do find a clear frequency it may not stay clear for long. Aggressive filtering needed to block out competing signals. I finally made contact! I answered Bob’s CQ call from Ireland. It was a good conversation. Bob was operating his home radio remotely from his holiday home which by sounds of things was not far away. Though again, we find the challenges of hilltop operating. It wasn’t long before strong signals near to Bob’s frequency started to crowd him out. I could filter them using the KX3’s digital filters but this reduced the amount of Bob I could hear too. I ended up with just 1kHz. Another surprise came when I took down the mast. Even with the antenna lying on the ground I was receiving S9 signals! I guess dry peat isn’t so conductive. Maybe it also lends credence to the idea that such a low antenna on such a long wavelength band is almost “on the ground” anyway. The lights of Skipton become visible as evening draws on. Descent was by torch light. It’s a while since I’ve navigated in the dark, which becomes harder as distant context is lost. It was a case of follow the path until I reach the wall. Distances seem longer. I didn’t have GPS at this time as I’d varied from my original plotted course. I came off the mountain at about 21:30 British Summer Time after a good long hike and two successful activations.